From bright and tangy raspberry to rich and elegant plum, we can’t get enough of berry pink in all of its delicious shades. As a jewel tone, it ranks high on our list for its ability to pop against neutrals and liven up a look. Deeper hues and cooler tones are moody and romantic, while lighter shades can make an eye-catching statement. Have a little fun by adding this syrupy sweet, of-the-moment color to your wardrobe this season. Moody, rich plum is a great way to try a statement color if you’re used to wearing darker pieces in the fall. Opt for cooler tones in styles like a classic plaid scarf, an opulent printed boot, or sophisticated stovepipe trousers. This color looks especially luxe in knits. Give it a spin in a turtleneck sweater dress. Want to turn heads? 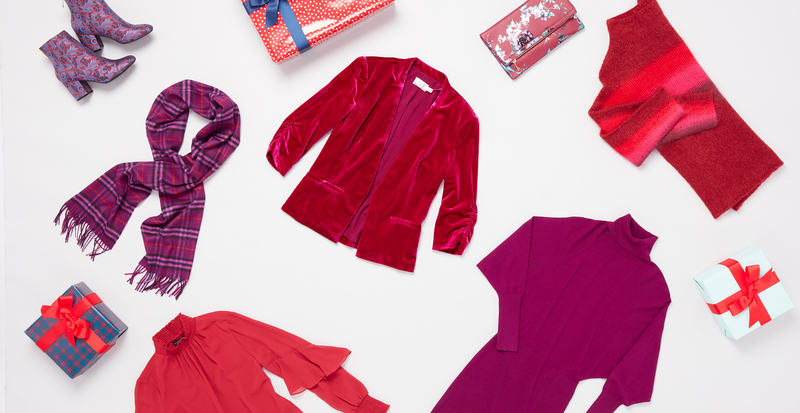 Choose a regal raspberry hue. This bold, saturated color creates an effortless focal point. Layer it on as a luxe velvet blazer or a statement sweater with voluminous sleeves, or tote it in the form of a clutch with gorgeous florals. For a color that’s less intense, but no less tempting, try a lighter shade of berry. A velvet slingback pump or draped dress is soft and elegant. For a brighter take, this vivid faux-wrap top can be paired with a sleek, modern bottom. Whatever hue fits you best, you’ll be deliciously on-trend.